"He had just recovered from typhoid. He complained of having a tingling in his feet and an extreme back pain. He repeatedly said that he feels like his muscles were tightened. I thought it was just tiredness but he had several unexpected falls and I realized that something is wrong. Within 2 days, his legs were paralyzed and it claimed his whole body. I have nightmares about the pain he has to endure, I can't understand what is happening to his body. 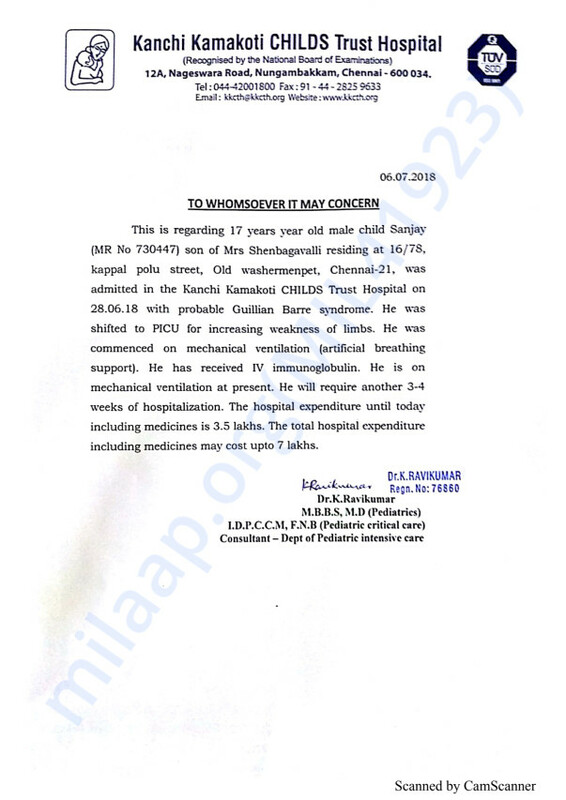 Now my son is ventilator bound. I don't know yet if he can speak. 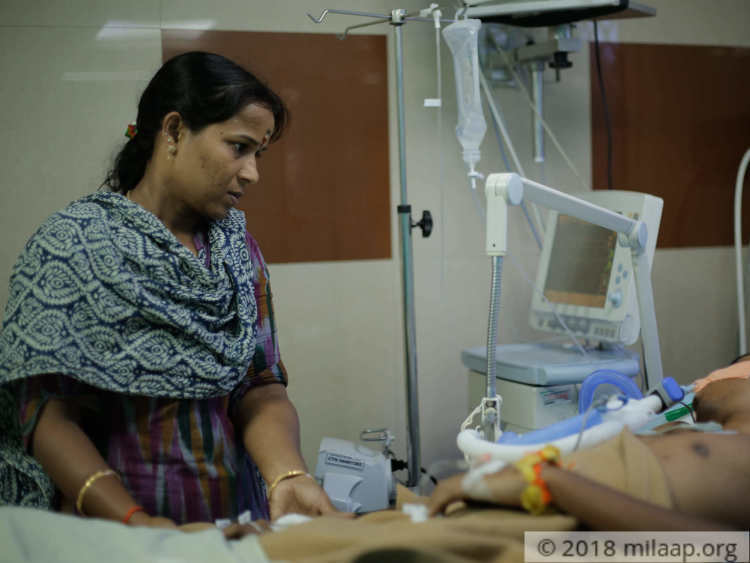 A very rare condition robbed his ability to move, to communicate and most importantly all his dreams"- Shenbagavalli, mother of 17-year-old Sanjay. Sanjay was all set to join college. He had chosen BCA and aspired to become a successful computer programmer. He was a very active and cheerful boy. 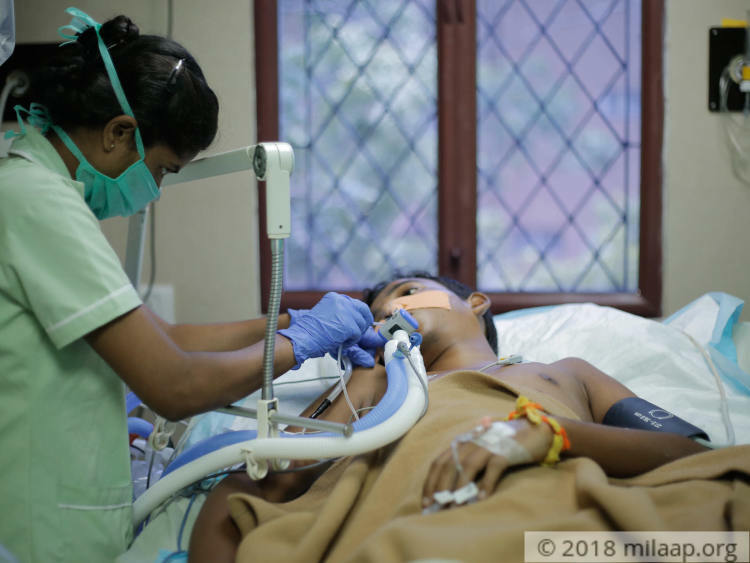 It came as an utter shock to his family and friends that he was struck down with a rare condition called Guillain Barre Syndrome, where the body's immune system attacks nerves due to which weakness and tingling sensations can spread rapidly, paralyzing the entire body. "I rushed him to the hospital immediately when he couldn't even put his feet down. He was taken to the ICU and started on treatment but it did nothing to stop the progression. 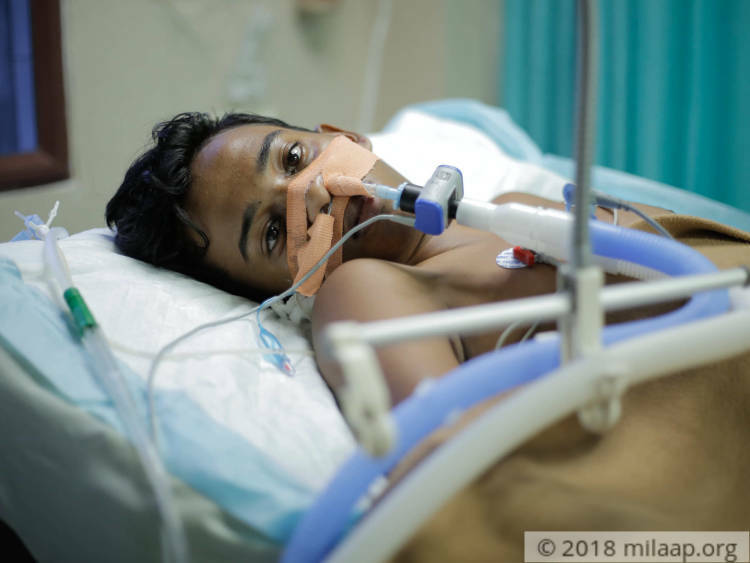 He was paralyzed and on ventilator support. After 2 days, he opened his eyes. He uses the 'communication chart' to point out if he needs anything. It is heartbreaking to see my son going through so much pain and trauma. I'm worried about his mental health. 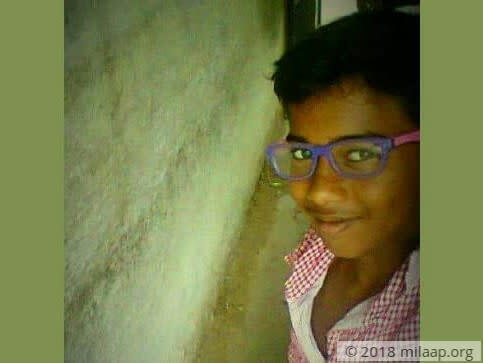 How can a young boy who was brimming with so much of hope just a week ago, can endure this suffering? - Shenbagavalli. Shenbagavalli's life has always been full of struggles and challenges. Her husband passed away 11 years back leaving her and two children Kavya (19) and Sanjay (17) all alone. She gathered all her strength and worked hard to raise her children. She also takes care of her husband's father who is 87-year-old now. She has always stayed strong but now seeing her son lying down with no movements in his body is taking all her strength away. "I live only for my children, they are my life. Even when Sanjay was a child he used to tell me that he will grow up and take care of the family. He always felt sad that I work so hard to pay their school fees. He made me proud when he got merit-based admission in two colleges. Now his life is upside down. I don't understand his condition, doctors say that it can be cured. I'm waiting for that moment. I want my son to live a normal life." - Shenbagavalli. 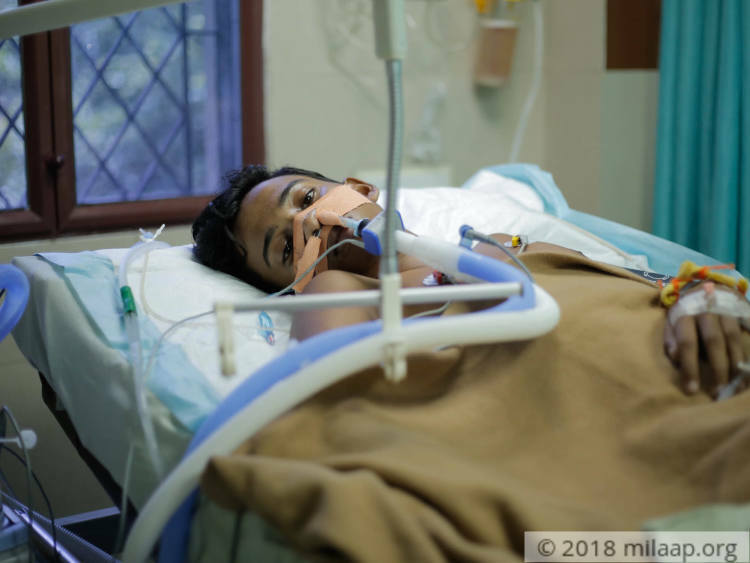 Sanjay is now on ventilator support. He is given immunoglobulin which functions as antibodies and medicines to strengthen his limbs. All his limbs are completely weakened and he needs 3-4 more weeks of treatment to recover. Shenbagavaalli is mentally exhausted, and financial constraints are crashing her down.
" I have studied only till 12th. When my husband left us, I started to work in a play school. I earn Rs 10,000 per month. I save every rupee for my children's education. Since Sanjay's diagnosis, I have never been able to go to work. I still have unpaid bills. I don't have money to buy even medicines. My family members are helping us but I don't know how long I can manage with that." 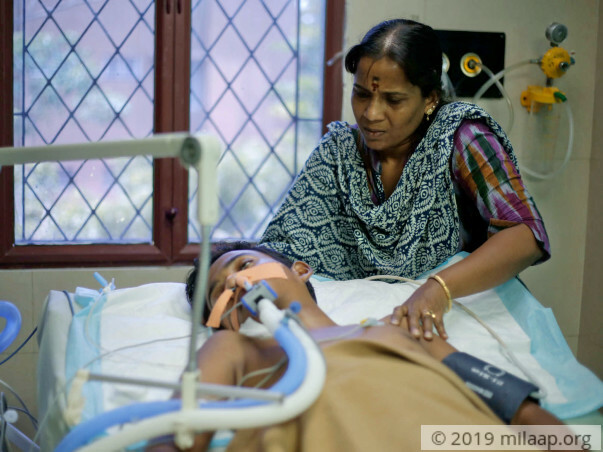 Shenbagavalli, a single mother is struggling to save her son Sanjay who suffers from a very rare condition that has left him completely paralyzed. His limbs are weakened and he has no movement in his body. 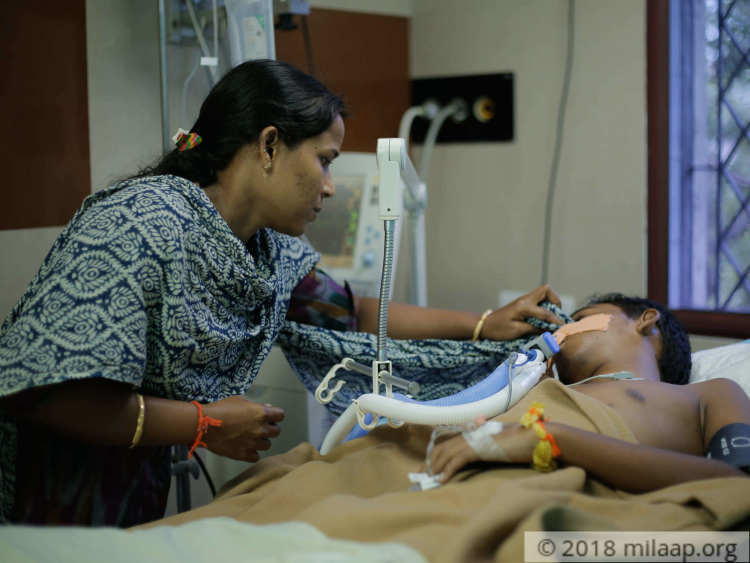 Sanjay needs ventilator support and treatment for next 3-4 weeks. Shenbagavalli, the sole breadwinner of the family has no source of income. The whole family has come to a standstill and they need your help to live a normal life. Sanjay is showing slight improvements in his health. He is able to move his hands a little and is yet to gain enough strength to move his legs. He is on liquid diet. The doctors have told us that it'll take time for him to recover completely. We are all hopeful about his recovery and are praying for him. Please keep supporting my son.